A new theory suggests that the symbols in the dragonglass cave could hint at how the Night King can be defeated. "Game of Thrones" Season 7 featured what can easily be considered one of the most important scenes of the series -- at least as far as the impending war against the White Walkers is concerned. I am, of course, talking about the now famous dragonglass cave scene in which Jon Snow showed Daenerys Targaryen the ancient carvings the First Men and the Children of the Forest made sometime around the first Long Night. In one of the previous articles, I talked about how the White Walker carvings may shed some new light on the Night King's identity. Now, it's time to tackle the symbols depicted in the cave. So what do these symbols mean? What will be their role "Game of Thrones" Season 8? Let's find out. Let's start things off with the actual screenshot of these symbols. — Game of Thrones Season 8 theories (@GOTS8theories) 15. новембар 2018. As a reminder, these particular symbols were shown while Jon Snow was explaining to Daenerys Targaryen how the Children of The Forest and the First Men fought against their common enemy, the White Walkers. That said, there's no doubt in my mind that the four figures above represent the Children, while the three figures below represent First Men. However, according to YouTube user Tony Teflon, these figures aren't just there to show us what happened in the past, but they are also a clue to how to defeat the White Walkers. Why else would they show us these carvings, anyway? Unless they are meant to play a role in "Game of Thrones" Season 8. The theory is that the three figures painted on the wall represent the three heroes that are needed in the fight against the White Walkers. But before delving into who these heroes might be, let's first discuss the symbol resembling an eye that you can see between these figures. The most logical explanation is that this symbol represents the Gods Eye, the largest lake in Westeros, with the Isle of Faces in its center. As a reminder, it was on the Isle of Faces that the original Pact between the First Men and the Children of the Forest was signed, so it seems exceedingly likely that this location will somehow come into play in "Game of Thrones" Season 8. And who knows, maybe this is where the Night King is heading, as I already theorized before. As for the spiral symbol, one explanation is that it represents the rock formation around the main Weirwood tree at the Isle of Faces. The symbol can be seen in "Game of Thrones" Season 6 history and lore video about the Pact, narrated by Max von Sydow (The Three-eyed raven a.k.a. Bloodraven). You can see the screenshot of the spiral symbol down below. — Game of Thrones Season 8 theories (@GOTS8theories) 27. фебруар 2018. And here's that same symbol in the history and lore video. According to Tony Teflon, the spiral symbol actually represents the Targaryen sigil. 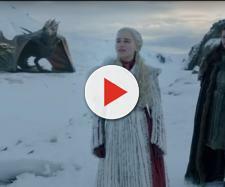 The theory further suggests that the three figures depicted on the wall represent the three dragonriders that are needed in the fight against the Night King. These dragonriders are Daenerys Targaryen, Jon Snow, and Bran Stark. Daenerys and Jon are an obvious choice as they both have Targaryen blood. Bran, on the other hand, seems like a bit of a stretch. But then again, the old Three-eyed raven did say that Bran will fly. So with that in mind, Bran flying a dragon, or rather warging it, is something that we could very well see in "Game of Thrones" Season 8. I do realize, however, that the Night King has Viserion now, but who is to say that Bran, being an extremely powerful skinchanger, wouldn't seize control over the undead dragon and in that way help to defeat the Night King. Tony Teflon's video provides more details about this theory.